Not having swum with Dusty for quite some time I was not quite sure what to expect. My family (Julie, Simone, Eli & Alex) and I all headed up to Co. Clare for the weekend hoping that we would see her again. As both the boys had bad coughs I knew that our time in the sea would be limited. And with this in mind, we arrived at White Strand, Miltown Malbay with only a short swim planned. Having heard that Dusty had been spending most of her time at White Strand now I fully expected to see her in the water. And I was not disappointed. A group of trainee divers were in wading into the water and you could see the tell-tale signs of a friendly dolphin in the area as people on the beach were laughing and pointing, whilst the divers were having trouble concentrating on getting into the water. Dusty’s dorsal fin could be seen darting from the dive boat to divers and back again. I got into my wetsuit as quick as I could and ran into the water with my monofin. It wasn’t long before I saw her heading over and I went under the water to meet her. She swam right past, buzzing me as she did. Then a spin around and she literally brushed against me. The next five minutes were spent playing the exact same games we did the last time we swam together with Dusty darting around me as I pretended to chase or ignore her. The kids were ready for the water now so I went back to the shallows whilst they were treated to Dusty coming right in, and swimming around them. Not long after we had to take the boys out as they nearly coughed out their lungs. It would be the only swim of that weekend but I was pleased to have renewed acquaintance, hopeful that we could return again soon. White Strand is actually a lot more pleasant than I had been led to believe. As I didn’t take a camera into the water my photos of the day were from the beach. 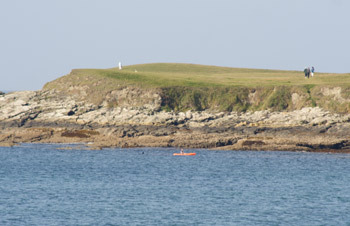 The one above shows the beach, with a backdrop of the small peninsula which appears to be a popular local walk. It is only 1km away from Milltown Malbay and there are not the same access rights issues that seem to have followed Dusty since she first showed up on the Clare coastline in 2000. There have been tensions over her being there but must say that when I was there it was all very relaxed. Maybe because it was the end of the busy season and people’s worst fears had not been realised. Since my swim with Dusty there have been disturbing pictures of Dusty (taken on the 8th of October) with extremely painful looking lesions. I did not see anything like that on her the 30th of September so what ever it is must have appeared in that following week.